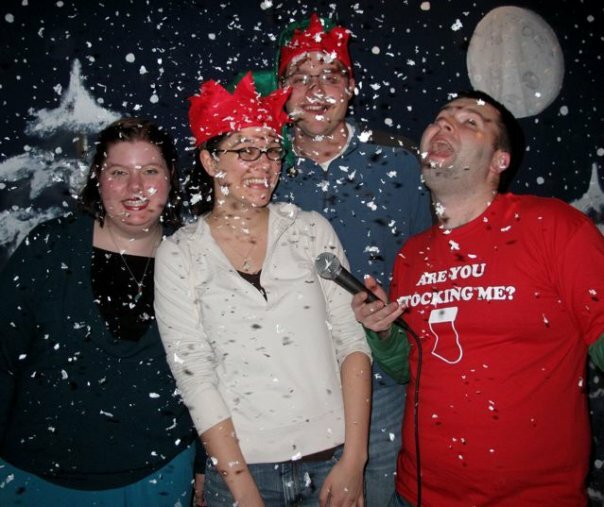 Karaoke + fake snow + elf hats = holiday awkwardness. It’s that time of year again. The season of pine-scented family rooms, rum-spiked eggnog, stressed out store clerks, and awkward social gatherings. Awkward holiday gatherings come in many varieties, but I will focus my survival tips here on what is perhaps the biggest offender — the holiday office party. Work parties can be uncomfortable because your co-workers may not be people you would normally choose to hang out with during your off hours. You’ve got Bill Lumbergh, the coffee-breath boss who makes you work unpaid overtime and drones on about — well you can’t remember because you weren’t listening. Then there’s Milton, your co-worker who clearly has Aspberger’s syndrome and keeps accusing you of stealing his stapler. Also you have Dwight Schrute who farms beets on the weekends and values his mediocre job above all else. Clearly you’re the only normal person at work. However, as awkward as it may be to go to your own office party, it’s even more awkward to go with your significant other. You don’t even know their co-workers after all. So what to do? Do you end up spending the entire evening playing Solitaire on your smartphone? I’ve been to my share of my hubby’s holiday work parties. My first was also the most, um, memorable. It was a dinner party at a local restaurant, complete with White Elephant Gift Exchange. The firm was generously paying for everyone’s food and drink. We hadn’t been there long, perhaps an hour at most, when our waiter informed my husband’s boss that they would no longer be serving alcohol. Many of my husband’s co-workers were visibly intoxicated, and the restaurant staff didn’t want to be held liable for any drunk driving incidents. The boss got into an argument with the restaurant manager, who finally agreed to continue serving alcohol. Then came the White Elephant Exchange, which included a few bottles of liquor, which people started chugging. Time for my husband and I to make a graceful exit. Any other favorite excuses for leaving an awkward party?